It’s true. I have gophers in my backyard. My backyard wall, (walls are common around houses in Arizona), backs up to a shallow ravine, commonly called a “wash” in neighborhoods like mine. I love the privacy the wash provides between my home and the neighbors’ homes. My neighbors can’t see me on my patio in my pajamas! However, the downfall of living by a wash can be an invasion by what I call my “creatures from the black lagoon” – gophers. 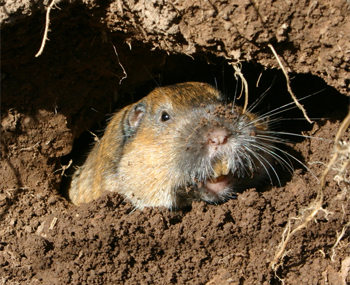 Gophers live most of their lives in underground burrow systems they have dug. They will occasionally venture above ground to feed on plants close to the burrow entrance. They are certainly not as charming and lovable as my rabbits and song birds. When I first discovered their holes and dirt mounds near the wall, I was so fearful of their invasion into my manageable, well-kept little backyard, with my lovely geraniums and faux green grass. I know it’s silly, but I was afraid to encounter a gopher face to face. Fear of even going near their territory soon became an obstacle to enjoying my backyard. Finally, I woke up one morning and decided enough of these mind games. I was not going to let fear of the unknown rule me. I was determined to overcome these creatures who, I thought, were perched in the bushes ready to jump out and scare me at any time. I put on my brave self, my cowgirl boots for protection, my oversized work gloves, and with a long-handle shovel, marched into the backyard saying in a loud voice over and over, “Lord, you and I can do this together. Help me overcome my fear!” I poked the holes and the mounds, just daring a gopher to show his furry face. I flattened the mounds and covered the holes with dirt. I faced my fear head on and felt empowered. Yes, I still have gophers, but my fear of them has been conquered. Fear of stepping out of my comfort zone. Fear of “what if” for the future. Fear of a major life change. Fear of more personal loss to come. Many times in the middle of the night or when I wake up in the morning I can be gripped with fear over some real or imagined hurdle that feels overwhelming. Can you relate? Fear of losing your home. Fear of losing a job. Fear of a serious illness. Fear of a severed marriage. Fear of a broken relationship. You and I can control our fear or let our fear control us. It’s as simple as that, but it’s not always easy. Many a day I have to release my fear and give it over to God through prayer, perseverance, and sheer determination to not let it consume me. I have to lay fear down at His feet, then stand up and move forward by His power and strength. The enemy will use every opportunity to rob us of trusting God. 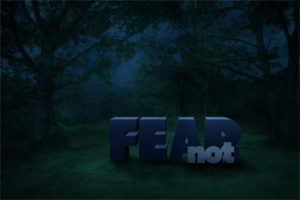 He will use the fear in our lives to discredit the power of God to handle our situations. If we let the enemy have a foothold in our day, fear can be all consuming and play havoc with our emotions. But I have learned that fear is not of God. “For God has not given us the spirit of fear….” (2 Timothy 1:7) All through the Bible, two little words “fear not,” encourage us and reassure us that we can trust God, regardless of our situation. I am with you, comforts us with the assurance that we are not alone. God’s presence is with us. I am your God, reminds us that He is our personal God. He cares about every detail of our lives. I will strengthen you, assures us that when we feel overcome with fear, God is our strength to overcome. I will help you, reminds us that God will not fail us or abandon us. He will walk with us through our fear. I will uphold you, assures us that God will lift us out of the pit of fear. He will support us and keep us from sinking into despair. And by the way, if you happen to find a gopher in your backyard, do not fear. Just give me a call. I’ll come over and we’ll conquer the critters together. I love this! Fear has been such a HUGE part of my life. It kept me bound and far from what God wanted me to do for decades! Oh, the time I wasted letting fear rule my life. Now I tend to recognize it more quickly and force myself to face it, and it’s never felt as intimidating when I stood up to it as it seemed when I cowered behind it.